If you were to look at Valerie “Val” Hines Grohol’s Facebook page at some point on a Sunday evening, there’s a good chance you’ll see a post about the Philadelphia Eagles. Sunday also means Val will be watching the game one way or another, whether during a shift at Shots and Giggles or the Green Parrot, or from the comfort of her home — because, well, the Philadelphia Eagles. “I’m a very, very big Eagles fan,” she tells me more than once when I meet up with her right before the start of one of her shifts at the Green Parrot. A vibrating energy in the air mixes with the chatter of friends and the smell of freshly made popcorn coming from the vintage carnival king across from the stage. It only takes a few minutes of speaking with Val to feel like I am somewhere friendly with someone familiar. This is one of those bars that would be insanely popular even without trying. It takes a certain kind of bartender to make working at one of the coolest places on the island seem like all they are doing is bartending for their closest peers. It’s that everyone is-a-friend, nobody’sa stranger mentality — kind of like an episode of “Cheers” every time you walk in. And Val fits right into the scene. She’s known around town for her sense of humor, easygoing vibe and genuinely happy state of being. It might be one of the many regulars who pop in to see her. Or it might just be Jon Stewart, who Val served while working her first hospitality job at the historical Holiday Snack Bar — “home of the homemade snacks” — in Beach Haven, N.J. Growing up between the suburbs of Philly and on the shores of Jersey, she understandably preferred to spend her summers closer to the water. It’s no wonder that Key West would eventually appeal to the recent early childhood development graduate when she was considering the biggest move of her life, trying to decide between St. Thomas in the U.S. Virgin Islands and Key West. She ended up choosing Key West because she didn’t want to fly her dog. She left the day after Thanksgiving and only meant to stay six months. That was 13 years ago. “I wanted to make a move before I woke up and realized I was 60 and had never gone anywhere,” she says of the spontaneous decision to chase the elusive dream of escape. As so many of us do, the pair came right back to Key West and haven’t left since. 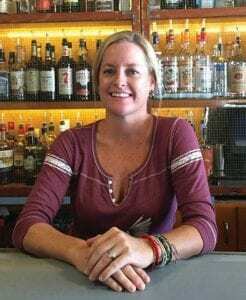 You might be familiar with a couple of the places where Val has previously worked such as the late (and still-talked about) Finnegan’s Wake Irish Pub and the Sunset Tiki Bar & Grille at the Galleon Resort. When I ask how she ever managed to score one of the most coveted jobs in the neighborhood at the Green Parrot, she says, “A good friend was having a baby and they needed the shift covered.” The rest is history. “I love that when I go to work I get to hear killer music,” she says as we wrap up so she can start her Thursday 3-7 p.m. shift at the Green Parrot. You can also find her there during soundcheck on Fridays, Saturdays and Sundays from 10 a.m. to 7 p.m.
She’s at Shots & Giggles from 6 p.m. to 2 a.m. Wednesday. But it’s the Green Parrot where you can find her the most. Green Parrot 601 Whitehead St. Shots and Giggles 201 Ann St.